As a stylistic interpretation regarding the effects of stress on a person, Kalainithan Kalaichelvan's "Stella Maris" paints a wonderfully sad picture of faith, spirituality, and just how much things have changed in our modern world. On the surface that is. Lurking just under the cut and dried narrative are other, more sinister questions. Fanatical behavior, selfishness, and even a collection tray sprinkled with PTSD. Don't let the unusual presentation of this short film fool you. It's not as simple as you may at first think. Lydia has had a rough go of things lately. Recently becoming a widow was bad enough, but now her son is sick. Deathly sick. It never actually says what ails him, but it looks like maybe some form of cancer. I can't imagine the pain of having to deal with both these dire situations in such close proximity, but Lydia has turned to her faith for support. As most woman of the time did. As she fiercely devotes herself to her only child, and her belief that faith will save him, we get to see the battles and transformations both herself and son Eli face, as they struggle their days away, avoiding all rational conversations and doings regarding her dying son. Lydia believes Eli's inclusion and performance in the church choir will not only show how strong his faith is, but hers as well. She desperately believes this is the only way to save her son. Ignoring her doctor, she pushes him to learn and practice even as he's at his worst. It's this belief that forms the true nature of this film. It's also what raises some interesting questions. Is her irrational belief simply the stress of the situation? Or is it actually the common mentality of the time this film takes place? Technology then was a shadow of today's medical knowledge. Even as we watch her slip into crazy land, her son Eli seems to mentally fortify himself against the coming end result. Seemingly knowing how things will play out. "Stella Maris" doesn't just make you ask questions of Lydia's sanity, but also of the strength a child holds. Most parents don't credit their young children enough when it comes to acceptance of a situation. And understanding. I couldn't help but feel Eli knew how things would play out. Knew how much his Mother loved him and understood why she was acting as she was. This unspoken theme pushed "Stella Maris" through it's seventeen minutes, and even helped gather some sympathy for a woman who was clearly delusional. "Stella Maris" is "that" journey. That flash before the darkness or for the faithful, that final breath on Earth before being lifted. 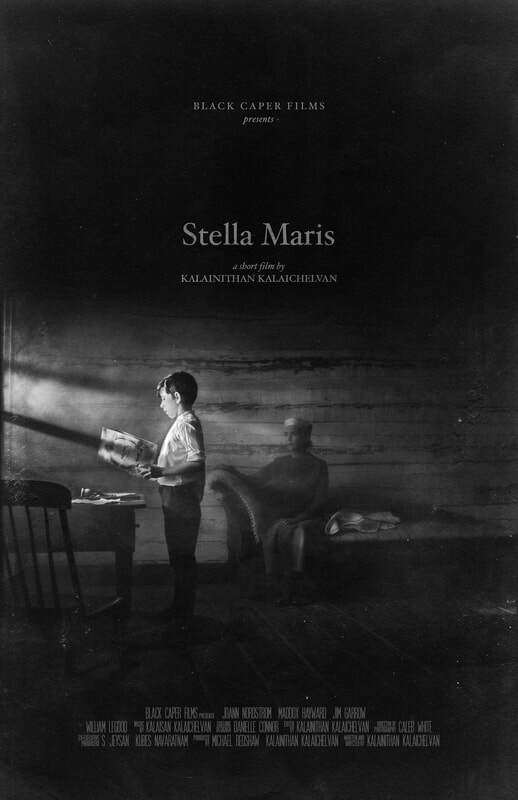 "Stella Maris" is about the end, the new beginning and those left behind to wonder what's what. A lot was wasted on the unique way this film is presented. The camera work is excellent, yet handicapped via the crop. It's hard to understand why such hard work would be put into the lighting, framing and even the movement of a shot, just to hack away the left and right sides. "Stella Maris" is a square movie. I understand the choice to "age" the look, but not the decision to crop the screen. Ratio aside, this really is a nice film to look at. The feel of days gone by fills your mind, and the attention to on-set details and props is simply stunning for a micro budget movie. Performances from JoAnn Nordstrom and Maddox Hayward are inspiring. Especially when dealing with such sad content. "Stella Maris" feels so much bigger than a small time independent film. It just goes to show that talent and planning really do go a long way. For the most part, "Stella Maris" is a great short film. It begs the viewer to ask questions beyond what is shown onscreen, gives them a glimpse into a way of life long forgotten, and doesn't shy away from the realities of emotional distress and loss. At the same time, there's really nothing terribly new added to the mix and although solid technically, it's not really much more than a decent story done by the book. The visual style of a long gone era is interesting, but again, nothing new and very gimmicky. The excellent use of knick-knacks and locations are a touch beyond the standard indie film, but again, nothing terribly unique. Where this film does pick up some slack is when you consider the casting decisions and the cast themselves. All those little things, that get you thinking beyond the film, are hinted at as you watch the wonderful actors play their parts. Yes. The story is a decent one, but it's the actors that really give it that needed kick. As a low budget independent piece, "Stella Maris" clearly goes above and beyond. It delivers the goods. As a film in general, it's one of those movies you'll watch and be happy with at the time. Two weeks after though, you may find any thoughts of "Stella Maris" far from your mind. Solidly above average yet nothing extraordinary, I humbly submit my personal rating of three and a half stars.